The doctors from Sir Ganga Ram Hospital have successfully removed a giant cervical tumor weighing 4 kg, equivalent to the size of a 9 months fetus from a 47-year-old female patient that presented to the hospital with the complaints of pain in abdomen and menorrhagia (abnormally high bleeding at menstruation) since last 10 years. The tumor was removed by using “Hybrid Technique” (Mixture of two techniques). The case was also published in May 2018 issue of the Journal of Obstetrics & Gynaecology Research by Department of Minimally Invasive Gynaecology, Sir Ganga Ram Hospital. A 47-year-old female patient presented at Sir Ganga Ram Hospital in January 2018 with complaints of pain in abdomen and menorrhagia (abnormally high bleeding at menstruation) since last 10 years. On her abdominal examination, a large firm mass was felt corresponding to 34 weeks gravid uterus. (34 weeks size of a fetus in the womb). 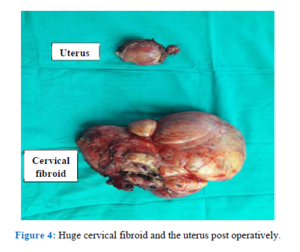 The patient came with an ultrasound abdomen done in 2009 at an outside center, for the same complaint and its findings at that time were of a fibroid of 3.3 x 2.3 cms, but no active management was done by the family then. The investigations done at Sir Ganga Ram Hospital revealed that this tumor had now grown to a giant tumor of 23cmx23cmx16 cm, weighing 4 kg and was occupying the space from the depth of the pelvis until four inches below breastbone and was adjoining liver. According to Dr. Debasis Dutta, Senior Consultant, Department of Minimally Invasive Gynaecology, Institute of Obstetrics & Gynaecology, Sir Ganga Ram Hospital, “ Our case is unique in many ways, firstly the huge size of a tumor, its rapid growth and its management laparoscopically. Moreover, this case amazed us because, in spite of knowing about tumor, no active management was done till date. Due to the huge size of the tumor, its precarious position and chances of it being cancerous (high chances of bleeding) made its removal challenging. Being cancerous, the tumor had to be removed in total, but at the same time, the blood loss has to be reduced and limited. Therefore, Hybrid Technique was planned in which laparoscopic hysterectomy was planned for minimizing the blood loss and laparotomy was performed for total removal of the tumor along with uterus owing to high suspicion of malignancy in the mass. Remarkable and challenging surgery possible only because of team work ! I had an opportunity to remove such big cervical tumors,size of full term pregnant uterus twice in a small hospital of tribal area that is Jagdalpur, Chhattisgarh around 20 years back. Both patients reported back with bleeding pv with growth in vault.